The undoing for these alleged criminals, say police, was an amateur rap video uploaded to YouTube. On Tuesday, Calgary police found a cache of drugs and weapons inside a home in the 1200 block of 17 Ave. S.W. Police seized more than 20 grams of crack cocaine,15 grams of marijuana, a machete, an Airsoft Uzi, an Airsoft Thompson sub-machine gun, a scale, cellphones and more than $8,000 dollars in cash. Staff Sgt. Martin Schiavetta with the Drug and Vice Unit said the music video assisted in the investigation. 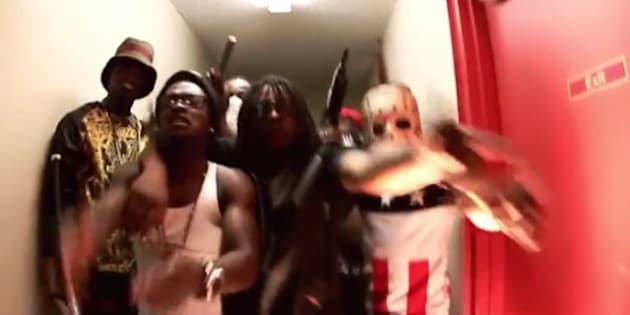 The video is entitled “Streets” by a rapper known as “Selloo.” The video was removed from YouTube shortly after investigators held a press release about the charges. Schiavetta said the use of Airsoft rifles in the video — and those seized from the home — is a concern. “Unfortunately, these guns are available and as you can see, to an officer or a member of the public they do look extremely real and are treated as real,” he said. Selwyn Marcus Caine, 30, and Djambou Teddy Wemini, 24, face a number of drugs and weapons charges.